Permission slips, report cards, book orders, projects, assignments...the due dates are piling up and seemingly never-ending, aren't they? 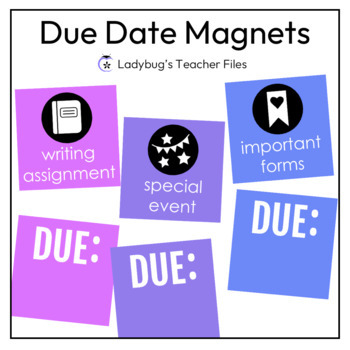 This year, I've been using a visual management tool that has been a HUGE help in keeping track of all of these dates...due date magnets! And these magnets are so easy to create. Simply print on cardstock, laminate, and hot glue a magnet on back! 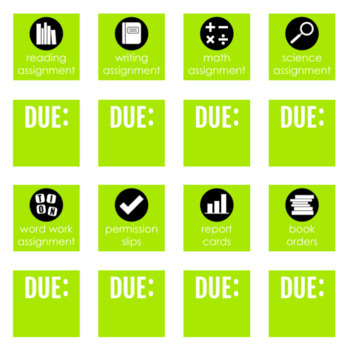 Each magnet features an easy-to-understand icon, as well as a place to write the due date. Now I post all of our important forms and assignments with these magnets on our front whiteboard...and the difference has been amazing. Not only are my students able to see due dates clearly (along with the forms/assignments themselves) but I find I am more organized and on top of those dates as well! editable text...choose the exact phrasing and fonts that will best meet the needs of your classroom. Please be sure to preview this resource to see all options included! Thank you for visiting my store! Please do not hesitate to contact me, should you have any questions about this resource.